Gorham’s Cave Complex covers a landscape of cliffs and caves that show extensive evidence of the Neanderthal way of life. The site is located on the Mediterranean side of the Rock of Gibraltar. The caves that are not submerged by the sea contain archaeological deposits. In Gorham’s Cave, Vanguard Cave, Hyaena Cave and Bennett’s Cave traces of Neanderthal occupation have been found. Some others have Early Modern Human deposits. The sites have been excavated since the 19th century, but only since 1989 the importance of the Gibraltar cave sites has been confirmed. Gorham’s Cave Complex is Gibraltar’s only WHS to date, and it was the main venue of this year’s World Heritage Travellers meeting. This Complex comprises four caves where tangible remains of the Neanderthaler way of life have been found. No skulls or other bones have been discovered in these particular caves (yet), but the archaeologists have been lucky earlier this year to find a Neanderthaler milk tooth! 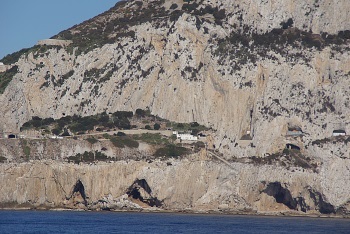 The Cave Complex is located at the southeastern tip of Gibraltar and its Rock. After casually strolling across the Spanish-British border and crossing the empty air strip, we took bus number 2 from the town center to Europa Point. Europa Point is a collection of monuments and memorials such as a 19th century lighthouse. The main landmark nowadays is the Saudi sponsored Mosque of The Custodian of the The Holy Mosques. We all gathered a bit further up the road at the Europa Advance Viewing Platform. I had unsuccessfully tried to find it on a map beforehand: this is a piece of tourist infrastructure still in the making. Essentially the 1st and 2nd Europa Advance Battery are being turned into viewing platforms and small scale interpretation centres. The Gibraltar Museum still has to clean up the 2nd Battery which has been used for firing practice by the army until recently. The 1st Battery is almost ready now: there are toilets and the structures to hold information panels have been placed. The information itself is still missing though, and entrance to the Battery is closed to unannounced visitors unlike ourselves. The site of the future viewing platform has been chosen well. From there the entrances to the caves can be seen clearly. The inscribed area also covers their natural surroundings, which essentially cover the southeastern flank of the Rock of Gibraltar. Our WH Travellers group was treated to an introduction talk about the area by Sue Davies of the Gibraltar Museum and two staff. It actually is quite hard to imagine what the landscape would have looked like, as the sea level was much lower when the Neanderthaler lived here and the cave dwellers looked out over a coastal plain. After the talk our group was split into two: 10 lucky ones were to go into the military zone, down the stairs and all up to the entrance of Gorham’s Cave. For conservation reasons the cave itself is closed to visitors. I’ll leave it to one of them to write a review of that experience. The others returned to the town center of Gibraltar, for a more in-depth presentation of the site at the Gibraltar Museum. Sue gave an interesting behind-the-scenes look at how the inscription came about and what the future plans are. I found out why the name of the WHS was changed from “Gibraltar Neanderthal Caves and Environments” to “Gorham’s Cave Complex” at the final stages of its inscription – apparently the Spanish objected to the use of the Spanish translation of the word “Environments”. The Gibraltar Museum does offer all tidbits of local history that can be expected from a regional museum of this size. Findings from the caves mainly include animal bones and stone tools. 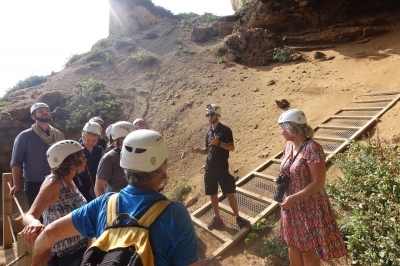 A difficult task lies ahead of the Gibraltar Museum team to find a way to further promote Gorham’s Cave despite its inaccessibility and conservation issues. Our WH Travellers group (rebranded during the meeting into the "World Heritage Appreciation Society") received a very warm welcome and good introduction to the site by them. As indicated in previous reviews, there is no really satisfactory answer as to how best to “visit” the Gorham’s Cave WHS. In May 18 we decided from the start NOT to attempt to visit the Viewing Platform during its opening times. This was partly because its hours (10-2 Mo to Fr) were very inconvenient for us and partly because we weren’t convinced of the added “value” from so doing. We wanted to take our Spanish rent-a-car into Gib to avoid buses/car parking etc but didn’t want to make the crossing in the morning “rush” nor stay overnight there at Gib’s relatively expensive hotels. Indeed, at 1.30pm, there was only 1 car in front of us at the border and we were able to drive directly up to the Jewish Cemetery to commence our walk on the Rock inside the inscribed area before 2pm (and, when we departed the Rock at 9pm, there were no cars at all in a queue in front of us and we didn’t even have to stop!). Foreign registered cars are not allowed in the “Upper Rock” area but we found free parking off Windmill Hill Rd around the area of 36.118339, -5.345241 (turn right just before the check point stopping non-Gib cars) which is only a 10 minute walk up to the “Jew’s Cemetery” entrance. We then spent over 4 hours exploring the “Upper Rock Nature Reserve” on foot including a descent of the Mediterranean Steps which pass through the inscribed area. On the way we entered the “Goats Hair Twin Caves” referred to in the Nomination as caves 40 and 41 out of 46 inside the WHS - these however are regarded as being “Paleolithic” rather than Neanderthal. The notice board at the end of the Mediterranean Steps states that they “form part of the Gibraltar Neanderthal Caves and Environments which was inscribed as a World Heritage Site in July of 2016” - a surprising use of the original title of the Nomination which, as reported by Els above, was altered before inscription in order to avoid Spanish “concerns”. It continues – “Much of the natural vegetation along the path has remained largely unchanged for thousands of years, providing visitors with a unique glimpse of the environment which has existed since Neanderthal times”. Whether this really enables one to appreciate the “Neanderthal environment” is another matter. At that time lower sea levels would have placed the shore line some 5kms away, so the “view” you now get on the Steps is very different. Whatever - we found our descent of the “Steps” well worthwhile. I won’t enter the argument about whether it is better to ascend or descend! After our walk we drove to the viewing platform area (which had been clearly visible below us as we descended the “Steps”). Its gate was locked - one can’t have people avoiding that £5 entry fee!! So we just parked in the entrance area and walked up the road which climbs above the platform - from where the view (photo - which shows the “limit” of the platform area) seems unlikely to be much different from that on the platform itself, even taking into account some parallax. Most of the signs were also perfectly photographable and readable using a telephoto lens!! In all honesty, none of the generally available views of the main sea caves, whether from land or sea, are really very good or particularly worth going out of one’s way to see other than “for the record”. OK - we “missed out” on the “presentation” and the chance to ask questions, but we had read the nomination file etc. Perhaps our main “loss” was not to have visited the Museum and seen articles from the caves, but I can’t say that I really miss not having seen its silicon models of “Flint and Nana”. The skulls on which these models were based were actually discovered in 1848 (even before the discoveries at Neanderthal) and 1926. The locations in which they were found (Forbes Quarry and Devils Tower Shelter) have, slightly surprisingly, been left outside the core zone despite their relative “fame” (mention of them will be found in most articles/text books about Neanderthals). ICOMOS accepted this on the basis that those caves had “limited or no further scientific potential”. It could be that we didn’t fully explore the prehistoric dimension, but we found other aspects of our “tour” of the Rock rather more interesting than its prehistoric ones! We didn’t bother with any of the “Pay to enter” attractions of the Rock (Cable Car, Tunnels, Siege Exhibition etc) other than the £5 “walker” entry fee into the Nature Reserve but the time we gave it passed in a flash. The views to the West on the way up, in all directions at the top (looking over the edge and wondering how on earth the Mediterranean Steps were going to find a way down!! ), and to the East on the descent, are superb if the day is reasonably clear. A new “Skywalk” (included in even the “Walker’s ticket”) adds to the experience. Then there are the birds/flora, including those apes - and lots of interesting WWII defences. These included (at O’Hara’s Battery ) a gun whose range covered the entire distance to Africa (29600yds v 25500yds) and provided fine views across to it! Which raises another issue regarding the inscription. Between 1996 to 2012 the UK T list entry for Gibraltar had been titled "the Fortress of Gibraltar" or “Gibraltar Defences” and the intention had originally been to inscribe the Rock for values related to its human occupation all the way from “prehistory” through to its WWII defences. This document contains a fuller description and a map of the previously intended site (starting on page 95). This decision to reduce the nomination’s area and scope to cover only the prehistoric period and to “major” on the Neanderthals within this must be considered a “success” in the light of its subsequent inscription. The previous version was too unfocused and also covered large areas of old military installations which Gibraltar wanted to redevelop without the restrictions which would have flowed from being inscribed (e.g where we had parked and the majority of Europa Point!!) but, in other respects, it was a bit of a shame. The entire “Rock of Gibraltar” is “unique” in its strategic location and the extent of its defences, whilst the “Neanderthal” aspects alone seem less significant and of more questionable OUV. There are a fair number of archaeological sites around Europe and the Middle East which contain “Neanderthal” remains. How many does the WH “List” require? We have visited the main “other” Neanderthal WHS at Carmel Caves in Israel (Though they cover other periods too). Vezere and Atapuerca have also yielded Neanderthal remains but those sites have chosen to major on other prehistoric aspects/periods. Carmel “got in” ahead of Gibraltar and used the “Comparative Evaluation” section of its Nomination File to “prove” the superiority of its caves on a range of factors over those of Gorham and elsewhere. This left UK/Gibraltar, coming along second, with a “problem” regarding how to find a unique value proposition for its Neanderthal remains. It did so largely by praising Carmel and finding a “time gap” it could occupy as its own - “In conclusion, the Gibraltar site offers a long and unique temporal sequence that covers the entire Late Pleistocene and it complements the Mount Carmel World Heritage Site: Mount Carmel covers the time range 350-82,000 years ago and Gibraltar the time range 127-13,000 years ago. 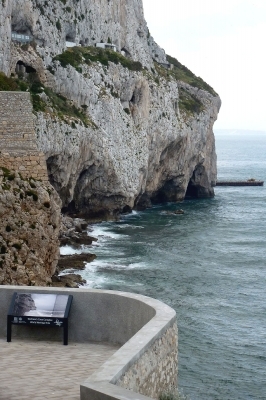 Together, the two sites offer a unique chronology from the beginnings of the Neanderthals (Mount Carmel), the earliest contact with modern humans (Mount Carmel), through the period of the Neanderthal population decline and eventual extinction (Gibraltar) and the latest arrival of modern humans into Neanderthal territory (Gibraltar). The second part of the Neanderthal story is currently missing from the World Heritage List. The Gibraltar site would amply fill this gap.” Hmmmm……??! In fact the Gibraltar caves have provided significant evidence about Neanderthal food, hunting, art/conceptual thought etc etc - but of course none of this is “visible” for a visitor. If you really want to “see” prehistoric/Neanderthal caves and historic strata then the Carmel Caves are undoubtedly the clear “winners” between the 2. They are also very easy to visit/enter. But even they don’t offer a great deal in terms of “visible value”! See my review . That is not to say that the Gibraltar Caves aren’t “important” within their rather “niche domain” of the “Demise of Neanderthals”. Long before they were nominated/inscribed they got a section to themselves in my “bible” of World Prehistory (“The Human Past”. Ed - C Scarre. Pub - Thames and Hudson. ISBN 978-0-500-28531-2). IMO, however, the real value of a visit to the inscribed area of Gorham’s Cave lies in the opportunity to explore the “Rock of Gibraltar” rather than to visit a “Prehistoric site”. Just get such "value" as you can from the site itself, take the “WHS tick” as a nice “extra” and then concentrate on the other aspects around you! In her previous review Shandos mentions the Neander Valley and we have visited that also. As she says, you shouldn’t expect to see anything much there either! The Feldhofer Cave where the remains were found and which gave the “species” its name, was completely removed by limestone quarrying in the 19th C and its exact location “forgotten”. The local authority has tried to provide a “tourism experience” with a museum containing yet more of those silicon models of Neanderthals and some sticks in a park indicating where Feldhof cave might have been i.e “above” in what is now the “sky”! Firstly, upon arriving at the entry, there's a sign stating it's only open 10am to 2pm, Monday to Friday. Luckily it was late morning on a weekday when we visited, but it would be a pity if you travelled all the way here on a weekend, to find it wasn't open. Secondly, there's an entry fee charged. If you're also visiting the museum (which we didn't quite have time to include), it's 8 pounds, otherwise it's 5 pounds. Luckily, they take credit card for if you don't have any pounds on you. The lady at the counter said that the entry fee covered the signs along the platform (about 3 or 4) plus a "presentation", which I assumed was a video presentation. If you have better weather than we did, I would recommend doing the Mediterranean Steps walk. It runs along the steep slope just below the top of the Rock, within the WHS, and visits some other caves higher up the Rock, that also show evidence of prehistoric inhabitation. One last recommendation: there are about 5 parking spaces at the visitors platform, only 1 of which was used on the day we visited (probably by a staff member). And they're free! Rather than leave you car outside Gibraltar like we did (and pay for the #10 bus from the border, then pay for another bus to Europa Point, then walk along the side of the road from Europa Point for nearly 1km, and then pay for your parking when you return to it), just drive here along the eastern side of the Rock. If no spaces are free, there's more parking at Europa Point. I visited this WHS in September 2017. I arrived at La Linea at sunrise and parked my car at the closest indoor car park to the border named Fo-cona. Just a quick look at your passport by the Gibraltar customs officials and I made it through to Gibraltar. I visited on a Sunday because I had booked the Gorham's cave and dolphin tour and missed out on visiting the Gibraltar Museum. I was rather disappointed as the only difference from any other dolphin tour is a short cruising by the inscribed cave complex and the recorded commentary. There's nothing spectacular or anything which you can't see from the viewing platform or pavement at Europa Advance Road - just a slightly different angle. My next stop was in fact Europa Point. I bought the all day Hoppa bus ticket for 3 euros from the bus driver and stopped next to the mosque. From there I walked to the concrete viewing platform and climbed over the useless gate to enjoy the view (top left photo). Next to the closed info booth (still no information boards) is the UNESCO inscription plaque (bottom left photo). 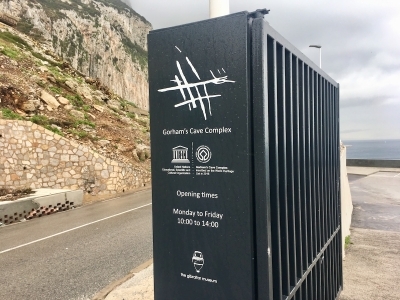 It's a pity that the Gibraltar politicians were quick on the mark to unveil the UNESCO plaque shortly after inscription but then were not able to supply some sort of make shift information board until the viewing platform project is finalised. I kept on walking till Catalan bay to see different parts of the Gibraltar nature reserves and already from there I managed to spot the Barbary partridge and Barbary apes. There were Barbary Ape Management Officials guarding the main ring road and chasing the monkeys. After walking back to Europa point, I headed uphill from behind the mosque past Jacob's Ladder and up the first flight of steps next to a covered swimming pool. After a few minutes, I arrived at Jew's Gate and paid the 1 euro nature reserve pass to hike up towards the Mediterranean Steps and O'Hara's Battery. I'd recommend this route upwards instead of downwards not only as it's easier on your knees but also because the views keep getting better and better until you reach the inscribed part on top. Make sure to wear sturdy shoes and bring some water but apart from that the whole hike took less than two hours including photo stops at Goat's Hair Caves, from the different military remains which are now excellent spots to rest in the shade and from the top (bottom right photo). 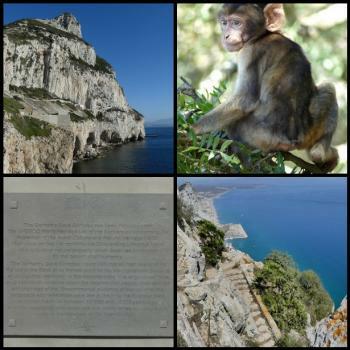 Being quite close to Ape's Den, there were already some young Barbary apes (top right photo) at the top part of the Mediterranean Steps trail. Instead of walking back the same trail I headed towards the Top of the Rock viewing gallery for some great views and went down by cable car. All in all, Gibraltar is worth visiting but Gorham's Cave Complex is just one of those WHS whose inscription is targeted more at attracting tourists to every territory or island (like the Balearics, Canaries, French extra-EU territories, etc.) rather than really contributing to any added value to the WH list. Nevertheless, the experience of reaching the summit of the Rock and beginning the descent of the Mediterranean Steps was one of the most memorable I have experienced in my 4 years of seeking out World Heritage Sites. With a pair of macaques eyeing us suspiciously and the wind blowing at several dozen knots the steep windy path down the edge of the Rock was both mysterious and daunting. The twin caves felt very much like 'cave-man caves' - by which I mean I could have imagined Neanderthals living inside them as they in fact did. It was a shame I wasn't able to see the main complex, but I'll be glad to return to this British Overseas Territory when it becomes more accessible. When we planned our trip to Andalusia, the question was whether it would be worthwhile to include Gorham’s Cave in our itinerary. The caves are not accessible for individual visitors and at that time there was no information on guided tours to the cave on the websites of Visit Gibraltar or the Gibraltar museum. In early June, I wrote an email to the Gibraltar Museum, but never got a response. But now there seems to be guided tours into Gorham’s Cave for a limited number of visitors (see forum post). So the best alternative for us was a "visit by sea". Dolphin Adventures offers such a trip, once a week on Sunday morning at 9:30, the price is 25 Pounds. The tour does not seem to be very popular, we were only 15 people on a boat for a maximum of 48 persons. The boat starts at the marina and goes around the peninsula to the eastern face of the Gibraltar Rock. After about 40 minutes we reached the caves. 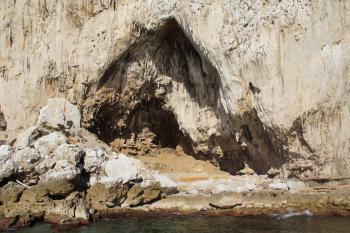 The boat stopped about 25 metres in front of Gorham's Cave (photo) and sailed slowly along the four caves: Bennet's, Gorham's, Vangard and Hyena Cave. This took about 15 minutes. It is not allowed to moor the boat and to go ashore. The caves are located next to each other right on the shore. Fifty thousand years ago, when Neanderthals settled there, the Mediterranean Sea was several kilometres away, since then, the coastline has significantly changed. The Gorham’ Cave Tour is offered only recently, for the fist time one week after inscription of the site, the company mainly offers whale and dolphin watching tours. The boat crew does not explain much to the caves, a commentary comes from tape, spoken by Clive Finlayson, director of the Gibraltar Museum. So there is some room for improvement. In the second part of the trip, we went away from the shore and watched some dolphins. Quite nice, but for me the views of the steep cliffs were more enjoyable. The eastern face of the Gibraltar Rock is by far more spectacular than the western, so it makes sense to do such a boat tour in the morning. We were back at the marina after a little more than two hours. Most WHS travellers will agree that you have to enter the core zone to properly tick off a site. We did so by walking the Mediterranean Steps, the last 1.5 kilometres up to the highest point, the O'Hara's Battery (at 420 metres), is within the core zone. The Steps start at the Jew’s Gate, the entrance to the Gibraltar Nature Reserve. The trail passes the Goat's Hair Twin Caves which are also mentioned in the nomination files because they were occupied by modern humans during the Upper Palaeolithic, but they are not related to the Neandethals. A seventh cave that is mentioned, Martin's Cave, should be near to the Mediterenean Steps, but we could not find where the trail branches off, maybe it is not accessible. The hike from the city center to the upper rock via Jew's Gate and down to the city via the Ape's Den takes about 3 to 4 hours, depends how fit you are, there are some steep sections. But you can shorten the hike by taking the bus to Jew's Gate and/or the cable car for the descent. The Gibraltar Museum is probably an interesting addition, though I do not know how many finds from the Neanderthal era are shown. However, we could not visit the museum, the opening times are quite unusual: on Saturdays it is open only from 10 a.m. to 2 p.m., and it is closed on Sundays and public holidays. Apart from the WHS Gibraltar doesn't offer much of interest, except a bit of British flair in southern Spain. Quite strange is the location of the airport directly on the border to Spain. The road to Gibraltar crosses the airfield and if an airplane takes off or lands, you have to wait at the traffic lights. So I have entered the core zone and I saw the caves entrances from a boat, sufficient for me to tick off this WHS, though it is also unsatisfying. I would be happy to have the opportunity to enter Gorham's Cave on a re-visit, maybe at an upcoming WH travellers meeting. Nearly five years ago on what I nowadays call my first true world heritage trip I ventured to Andalucia. Out of curiosity I decided to also go to Gibraltar and look across the straights to Africa. Having been at Europa Point at the very tip of the island I must have been within 500m of the site, but didn’t know. As such this was a tragic near miss for me. Thanks to our World Heritage Community Meetup 2017 and Ian’s and Els’ efforts I was able to correct this. Ian had arranged the tour with the Gibraltar Museum. They gave us a nice presentation providing the context you need to make sense of a prehistoric sites such as this. Half of our group were allowed to the entrance of the caves to get a closer look. The caves are still active excavation sites with yearly campaigns being carried out each summer. The caves are also in an active military installation. And if this wasn’t challenge enough, the caves are located in a hard to access part of the peninsula at the bottom of huge cliffs directly at sea level. As noted by Els the sea level was way lower when the Neanderthals lived here. So the caves overlooked a 5km long coastal plain. To get to the caves we needed to pass a control post at the entry of the military installation. They also made us sign some mighty tense waiver form and gave us a nice looking helmet. I was considering keeping it as souvenir ... From the military post you descend via a metal staircase down to sea level. The Vanguard Cave is just at the end of the stair case. For Gorham's Cave you need to hike across the rocks at the coast. Both caves are still heavily covered by sand. During the yearly excavation campaigns each year only a few centimeters are removed to get as much information as possible. Recent finds include a rock drawing, a hand print and a milk tooth. There were also Phoenician artefacts finds, but the OUV is tied exclusively to the Neanderthal finds. For the Neanderthals Gibraltar is the last documented site before extinction. Humans had not yet appeared in the area when the Neanderthals disappeared, so for once we are not to blame. Our guide, a resident researcher, argued that the weather turning hotter and wetter may have been the Neanderthals demise and our success. And in a way the Neanderthals are still with us as around 2% of the DNA of a European is Neanderthal DNA. So you could say they were less out-competed and more in-married. Many thanks to Ian and Els for setting this up. Gibraltar has one of the most iconic airports of the world. After crossing the border you walk right across the landing strip situated below the Rock. It’s quite fun to see a plane land with the traffic lights switching to red and the bar going down. Unfortunately, flight options are very limited and prices high. The other airport of the area is in Malaga. Be advised that public transport connections to Gibralter (La Linea) are limited and you are better served staying in Algeciras, the principal Spanish town across the bay from Gibraltar. From Algeciras frequent buses run to La Linea, the Spanish border town and from there you can walk across the border and catch a local bus. Algeciras also provides ferry connections to Ceuta and Tangiers. From Ceuta you can reach Tetouan by cab and it’s well feasible as a day trip from Algeciras. The closest train station is San Roca/La Linea. The name is a bit misleading as the station is neither in San Roca nor La Linea. You should be able to get a bus to La Linea. The train line itself is rather helpful as it connects you to Antequera and Granada. Another stop (not a WHS) along the line is Ronda, a picturesque Andalusian town. I skipped on this as Philipp was so kind to offer me a ride to Antequera. In addition, the trains run only a few times a day and I wouldn’t have been able to make the schedule work anyhow. As mentioned by Els, the best connection is to take Bus 2 from Market Square station to the end of the peninsula at Europa Point. It doesn’t run directly from the border, so you can either take Bus 5 (any bus saying city center) from the border to Market Square or just walk. The peninsula is surprisingly long and not really friendly for pedestrians as the little road space there is is used for the cars. Hard to imagine that it used to be even worse than it’s now, but supposedly they cut down on traffic. I would not encourage you to cross by car as you will spend some time at the border, parking spaces are limited and Gibraltans intent on towing your car if you violate the rules. Right now, you will have a hard time getting a good view of the site. The viewing platform is not yet ready. When this is the case (soon, but check with the tourist office) you get good views of the caves. Possibly, bring a binocular. If you are a group, you can also try to contact the museum and get a custom tour. We were not the only group this year, so this should be possible. Descending to the caves and the views we got were special. For the time being the best option is probably to join the Sunday cruise. Finally, the site includes more than the caves themselves and it is my understanding that hiking along the Mediterranean Steps should take you into the core zones with plenty of spectacular views of the cliffs that house the caves. The fortifications of Gibraltar are impressive and well worth a visit, even if they are a former tentative site. Climbing the rock, either on foot or by cable car, is the other tourist option and you will see plenty of monkeys along the way. "Cave Man" sites: "The steep limestone cliffs on the eastern side of the Rock of Gibraltar contain four caves with archaeological and paleontological deposits that provide evidence of Neanderthal occupation over a span of more than 100,000 years. This exceptional testimony to the cultural traditions of the Neanderthals is seen notably in evidence of the hunting of birds and marine animals for food, the use of feathers for ornamentation and the presence of abstract rock engravings."